1976 batch IPS officer Mr Harish Chandra Meena assumed the office of DGP (DIRECTOR GENERAL AND INSPECTOR GENERAL OF POLICE), RAJASTHAN. He was earlier posted as DIRECTOR GENERAL, HOME GAURD AND CIVIL DEFENCE, RAJASTHAN. He had been SP of various districts of Rajasthan like Jalore, Jhalawar, Pali, Barmer and Banswara. He was also IGP of CRPF. 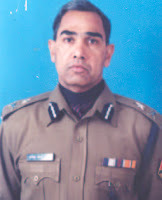 He was also awarded the 1996 Indian Police Medal and 2002 President Medal. On the occasion he get the guard of honuor and later on he inspects the parade.